Laremy Tunsil, No. 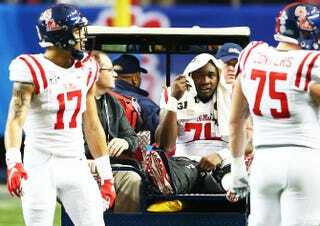 78 of the Ole Miss Rebels, is carted off the field after being injured in the second quarter against the Texas Christian University Horned Frogs during the Chick-fil-A Peach Bowl at Georgia Dome Dec. 31, 2014, in Atlanta. An Ole Miss football player has been arrested after reportedly punching his stepfather in defense of his mother, the Clarion-Ledger reports. All-American left tackle Laremy Tunsil turned himself in in connection with an altercation that started Thursday night, university coach Hugh Freeze confirmed over the weekend. Freeze said that Tunsil went after his stepfather, Lindsey Miller, after the man allegedly shoved his mother, Desiree Tunsil. "Laremy realizes he could have handled it differently," Freeze said in a statement Saturday, according to the Clarion-Ledger. "I am proud of him for standing up for his mother and protecting his family." Freeze told the news site that Tunsil and his mother have pressed charges against Miller, who has not yet been arrested. Miller denies the claims, saying that the altercation was a result of an argument with Tunsil, who Miller says instigated the fight, and that he never pushed Desiree Tunsil. Miller claims that the 305-pound junior hit him six or seven times and that he has obtained a restraining order against the football player. "As we gather more facts, we will act and make a decision accordingly," Freeze said. Tunsil, the Clarion-Ledger notes, is one of the country's top offensive linemen and is expected to be a top five pick in the 2016 NFL draft. Tunsil is currently tending to a broken leg and dislocated ankle that he suffered during a game in December in the Peach Bowl. However, he is expected to be up and running by the beginning of this upcoming season.